For nearly 30 years, Chris has been a union official first working for the Finance Sector Union and then, from 1994, at the Australian Council of Trade Unions (ACTU) where he was the Assistant Secretary from 2002 to 2008. 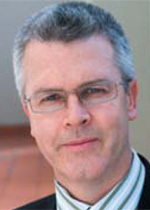 Since 2009 he has been Chief Executive Officer of Professionals Australia (formally the Association of Professional Engineers, Scientists and Managers Australia) - an organisation that represents more than 25,000 engineers, scientists, interpreters, translators and other technical professionals. In this role, Chris works with senior levels of government and industry to address the issues that impact on the working lives of these professionals. Chris has a Bachelor of Commerce Degree (Economics and Industrial Relations) and a Graduate Diploma in Labour Law. Last Updated: 2014-10-22 08:45:01 by Unknown.